The question of how long sake lasts is actually quite difficult to answer and, certainly, there are a few breweries experimenting with ageing and maturing sake longer than what we traditionally consider a ‘safe’ or ‘wise’ period. This process is distinct from koshu (intentionally aged sake for longer than three years) which tends to have rich and deep umami-led flavours, often they are quite sweet too. What I’m talking about here are brewers who are either maturing their sake themselves for prolonged periods of time (but generally less than three years) or designing the sake to be sold ‘fresh’ and then develop over time. Some brewers are even doing this with namazake (unpasteurised sake), some Muroka Nama Genshu (unfiltered, unpasteurised & undiluted) rather suit a bit of maturation! Anyway, aside from those sakes – which, I hasten to add, are few and far between – most sake has a ‘best before’ but establishing that for each individual sake is difficult. There are, however, some general rules we can use to inform our predictions. Added alcohol sake (non-junmai or aruten sake) generally lasts longer than junmai. The practice of adding alcohol to stabilise sake and prevent spoilage (hashira shochu) has been used since the Edo Period and breweries are well-versed in it. In the production of futsushu (non-premium sake) brewers are allowed to add more distilled alcohol to their product; this can mean the sake is a bit rough and unbalanced but, what it invariably means is, it’ll have a good shelf life. The highly nuanced, fruity notes of ginjo-style sake are the first to change. Bummer huh? The most expensive sake tends to be the stuff that suffers the most! This doesn’t mean the sake will be ‘off’ or ‘spoiled’ it just means these aromas and flavours are the first to change, moving away from where the brewer originally intended. NB – you may like this! It isn’t necessarily bad! Just don’t be surprised if the same daiginjo you opened in February tastes different to the one you open in October. Personally I embrace the change! Richer style sake will age the most favourably. Junmai – generally being the richest style of sake – will age the most favourably, partly because the changes will be assimilated into (or disguised by) the sake’s natural flavour, body and profile. Sure, the sake might become richer or develop more body but – generally this will fit in quite well with the sake. Honjozo – on the other side of the triangle – of course, has added alcohol and so will, generally, remain stable for longer. rice vinegar/lactic aroma – sometimes namazake (unpasteurised sake) may express more of this aroma, it is called ‘nama-hine‘; although, there are some nama-hine fans out there! This is not an exhaustive list and there are plenty of other smells associated with ‘off’ sake. Most others are to do with the production process, however, not storage conditions. Sake in Japan should have a date printed on it (but not always in UK). This will either be in the international format in YY.MM (年月) or MM.YY (月年) or in the Japanese format where the year is given as a two digit numeral relating to the number of days since the current Emperor came to power (the best way to know that is to google “japanese calendar year 2017”, for example). Nine times out of ten this is the date the sake left the brewery. It is never the best before date! 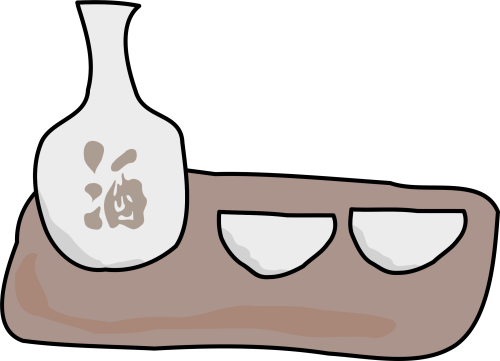 Generally, most sake should last about a year but factor in the general rules above. I’ve had futushu that’s been sitting around for two or three years with no ill-effects, similarly honjozo and even some junmai. Super balanced and perfumed junmai daiginjo, however, you’re going to notice the change earlier. What about open sake? How long does an open bottle of sake last? Sake is more favourable than wine when it comes to an open bottle. Again, follow the rules above and use about a week as your average. It is important to not get too fixated on whether a sake is off or not the question is: do you like it? Also, don’t keep any sake you have around for a special occasion – drink it! Sure if your birthday is in a few month’s time it’s no problem but just try not to let sake sit around for ages.